Marie Laure may be blind, but her devoted father Daniel makes living in Paris an experience full of wonders. As the locksmith for the Museum of Natural History, he gives her the miracles of the world to hold in her hand. He also allows her to explore Paris by creating a miniature of the city that she can memorize. When the Germans occupy Paris, father and daughter flee to the seaside town of Saint-Malo to live with her great-uncle. But Marie Laure doesn't know that her father has been entrusted with a tiny wonder that will bring danger right to their front door. Alongside the story of Marie Laure, we meet Werner and Jutta Pfennig, orphans who live in a charity home. The two siblings are fascinated with science, especially with lectures they hear over the radio from a kindly scientist. Werner has a gift for science, for electronics in particular. When the Nazis learn of his skills, they send him to a training school where he views brutality firsthand. My husband accuses me of being a reader of particular tastes. It is not unusual for him to assume that my newest read takes place around WWII and make a lovingly sarcastic comment. He's usually right. In my efforts to diversify my reading a bit, I didn't pick up this book for a long time. But I saw review after review saying that this book was stunning. It turns out that all of those reviews were right. There are so many things to love about All the Light We Cannot See. The first beautiful thing is the relationships that Mr. Doerr creates with seeming ease. Marie Laure and her father are devoted to each other. She adores her dad and he teaches her to survive and even to find magic in the everyday. Werner and his sister Jutta have a typical sibling relationship where you drive each other crazy but stand up for each other no matter what. Werner's relationship with his friend Frederick is heartwarming and heartbreaking as Werner learns to do what it takes to survive while Frederick stands up for what he believes to be right. Each person is drawn with so much detail and care that you can't help but love each one. Throughout this story, the characters observe the beauty of science and story. Marie Laure is fascinated by the minerals and creatures found in nature while Werner finds peace and purpose in determining how machines, particularly radios, function. Both of them understand the importance of story, whether found in the pages of a book or passed from one person to another. It reminded me of my beloved childhood readings of Madeleine L'Engle's novels where you didn't have to choose between science and faith, nature or art. At the heart of this book is the potential of people for both good and evil, and how we are all connected. Early in the story, someone points out the limitlessness of Werner's potential as a scientist and as a person. But he battles between doing the right thing and doing the thing that will ensure his survival and the survival of the people he loves. Over and over again, we see the danger for every person living in Europe as war rages around them. How can anyone maintain their innocence in a time of war? As readers, it seems inevitable that we will eventually tire of reading stories set in the same time period. But as someone who has read many novels set around WWII, this book was as exhilarating and heartbreaking as a story experienced for the first time. All the Light We Cannot See rather resembles the intricate tiny cities that Daniel creates for his daughter. This is a book that you could read it over and over and find new connections between the characters, their stories, and the themes of beauty and pain, devotion and sacrifice. It is haunting and beautiful and will certainly be my favorite book of this month, if not one of my favorites in 2014. Great review! I agree that I can sometimes get tired of reading books around the same time period, and WWII is one of the most popular. But when it's done right, with a bit of an original perspective, I'm all for it. Plus, I've heard mega-rave reviews on this one. Everything about this book seemed like it should be overdone or obnoxious - World War II story, a blind girl, a German boy with moral dilemmas. 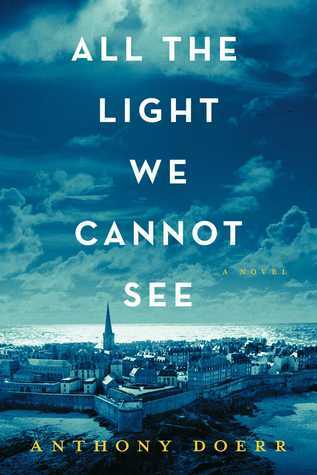 Instead, Anthony Doerr works some kind of authorial magic and it was amazing. What a touching review! I finally have a good idea of what the story is about, and why I would love to read it. Thanks for your eloquent words...wonderful! Oh, this just sounds wonderful! What a great review! Alternating perspectives make me crazy, but I'm going to make an exception for this one. Because EVERYONE loves it! I'm down with it! I know! It's terrible to actually have to think about the last book I read with a single perspective. This one is so great, though. I think you will enjoy it! I didn't actually finish this book (had to put it down for work reasons, not for not-liking-it reasons) and agree with what you said. Well done, full of humanity and generosity, and very emotionally engaging. That's a great description - "full of humanity and generosity." That's exactly it! I think all of us that have read this book have struggled to do it justice when reviewing it. Yours is the first I've read that actually manages to capture the essence of the book completely. Well done. This makes me want to read it again! I've seen a LOT of reviews of this book over the last little while, but yours is the one that most intrigues me. Will definitely be reading this now. Thanks so much. I hope you love reading it! I'm so glad you will be reading it. Let me know what you think when you finish it!